Perfect sound, feel, looks, and durability all at a perfect price. Perfect. It's a word that's thrown around a lot these days. But with the DM8 Pro Kit, you might just find it. The Alesis development team painstakingly examined all aspects of what makes a kit the best possible choice – all with the goal of creating the perfect electronic drumset. If you imagine sound, feel, looks, durability, and price as the faders on a mixer, the DM8 Pro Kit is the perfect mix. An electronic drum kit can't be called perfect without mind-blowing samples. The DM8 Pro Kit features the barrier-shattering DM8 high-definition drum module with Dynamic Articulation™. 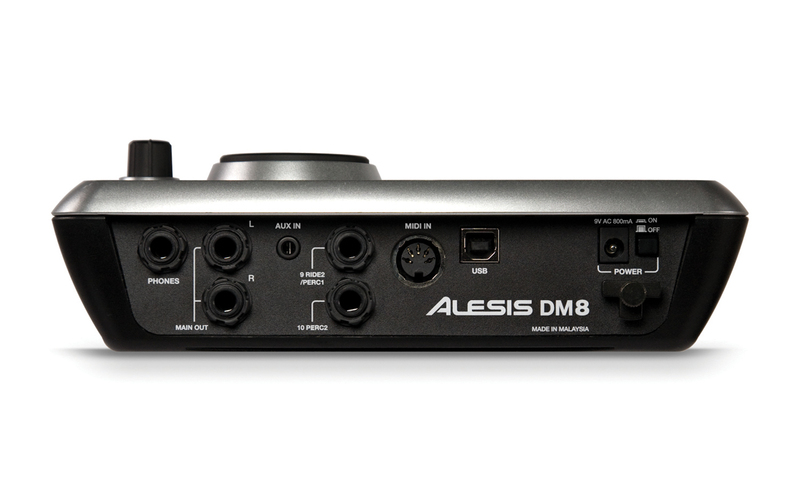 Our latest drum module in a line now spanning 20 years, the DM8 builds on the success of the top-of-the-line DM10. The DM8 shares the DM10’s essential architecture, including playback of genuine recordings of real drums and cymbals and advanced Dynamic Articulation™ multi-samples. It's an ultra-compact module, which means integrating components of the DM8 Pro Kit – or the entire setup – into acoustic drum setups and percussion rigs is easy and comfortable. Imagine adding electronic, percussion, and rare, ethnic sounds without giving up the organic, primal power of an acoustic set. Never before has so much power been offered in a drum module this compact, at such an affordable price. 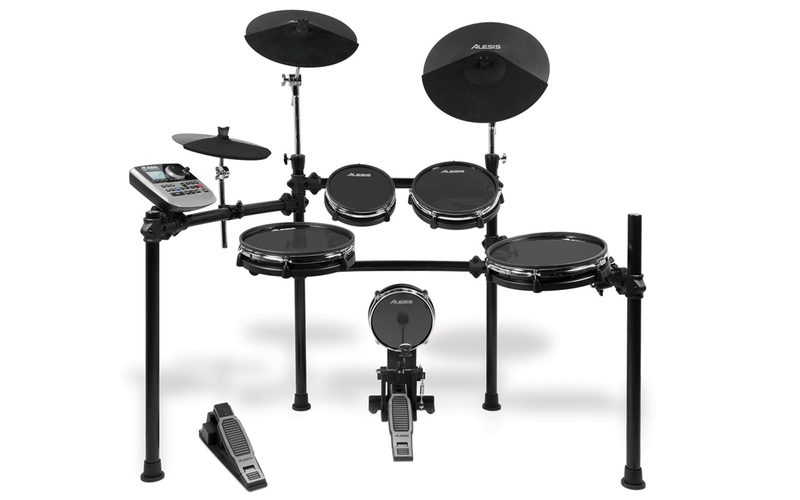 The DM8 Pro Kit is the first electronic drumset with 16-inch Ride and 14-inch Crash cymbal pads, and it’s also Alesis’ first kit with large, 12-inch snare and floor-tom pads. 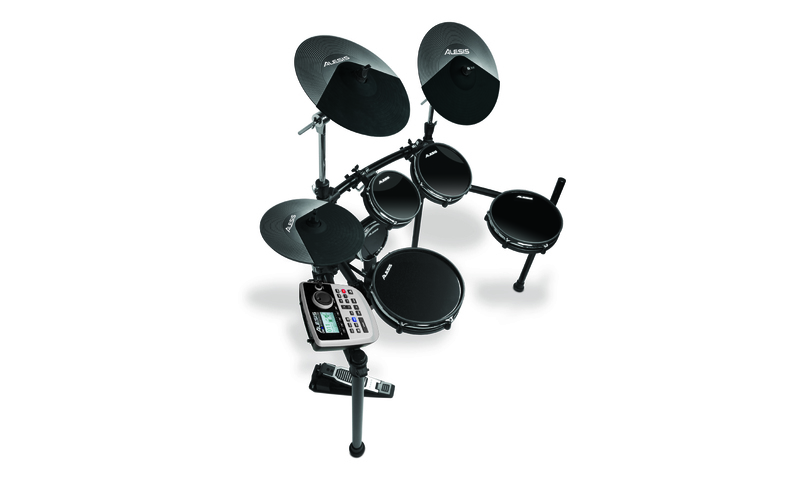 The DM8 Pro Kit features Alesis’ RealHead drum pads and DMPad Cymbals. RealHead pads feature real, tension-adjustable drumheads and real triple-flanged counterhoops for the feel you demand. You get a 12-inch snare, 8, 10, and 12-inch toms, and a kick pad that accommodates single and double pedals. If you need to quiet the rims’ sound, the kit includes a set of optional rubber rim mutes. RealHead snare and tom pads mount on standard 10.5mm L-rods with low-slip, knurled mounting surfaces. You can use virtually any single or double kick pedal with the RealHead Kick Pad for the pedal feel you prefer. Everyone knows it can be tough to be seen on stage when you’re a drummer. You’re in the back, usually with no lights. And forget about being able to dance. That’s why our designers took great pains to make the DM8 Pro Kit look as great as it feels and sounds. You’ll notice the sleek lines of the DM8, bathed in Raw Aluminum painted finish, which just might match your MacBook Pro, iPad, iPod, or iPhone. Drummers know that hardware can make or break a kit. If you check out old footage of Ringo or Buddy, you’ll see their stands flexing and flopping, and the drummer or their drum tech chasing “walking” hi-hat stands. That’s why we carefully considered every element in designing the DM8 Pro Kit’s StageRack. This rugged rack is built for durability and stability – from the ground up. In engineering the perfect mix, we couldn’t ignore the matter of price. Let’s face it: there are a lot of really expensive electronic drumsets out there. Sure, we could try to sell you something for multiple thousands of dollars. But that wouldn’t be perfect. You see, we set out to deliver the best possible blend of sound, feel, looks, durability, and affordability in any electronic drum set. 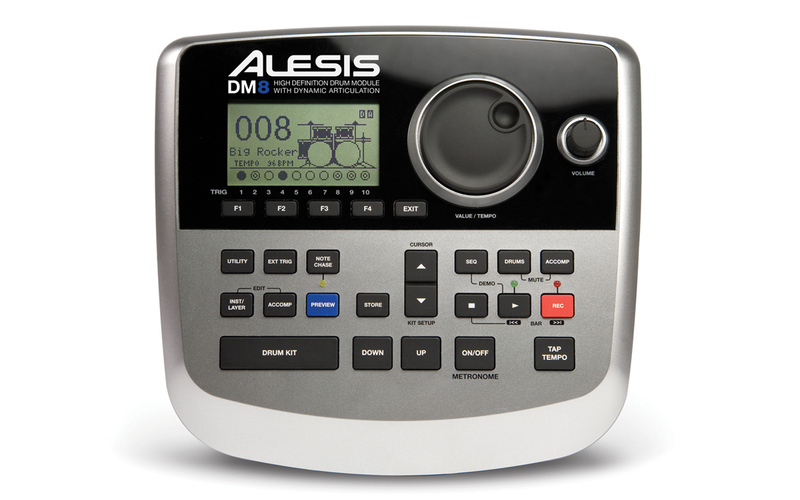 Check out the DM8 Pro Kit at your Alesis dealer and decide for yourself if we were successful. MacBook Pro®, iPad™, iPod®, and iPhone® are trademarks of Apple Inc, registered in the U.S. and other countries.